Each year AICA Germany distributes three awards: The Museum of the Year, The Exhibition of the Year and The Special Exhibition. On November 14, 1991, the AICA general meeting in Cologne resolved to choose an annual Exhibition of the Year. This goes back to corresponding activities of AICA-USA, which German participants learned about at the 1991 international AICA Congress in Santa Monica, California. Klaus Honnef reported in Cologne as to the results of the selections made by American colleagues for 1991, inasmuch as they had to do with art in Germany: the exhibition Degenerate Art at the Los Angeles County Museum of Art was awarded first place, and Sigmar Polke’s American presentation (San Francisco Museum of Modern Art) reached 4th place. The decision to try to select an Exhibition of the Year in Germany was made easier due to the delegates’ belief that the regular announcement of such a critics’ vote would create more of a public impact for AICA. All AICA members would be allowed to take part in the selection of an Exhibition of the Year, and the result would be announced at the general meeting each fall. Time and again in subsequent general meetings, critical discussions erupted around the fact that the choice of Exhibition of the Year was usually awarded to “major exhibitions,” while original projects from smaller institutions, private galleries or from artists’ initiatives never received a majority of votes. In 1995, a solution to this problem was found, and one year later it was put into action: since 1996, in addition to the Exhibition of the Year, there is also the distinction, Special Exhibition. This decision is made by an individual juror, who justifies his choice to the members at the annual general meeting. The juror changes yearly. The building of the first passive house in Germany is the achievement of the middle-sized Upper Swabian town of Ravensburg (population some 50 000). Opened in 2013, the structure resembles a medieval storehouse. With its exterior shell of recycled vintage bricks and a vaulted roof, its design is wittingly in keeping with the old town centre. Notwithstanding, the entire complex is double-clad, which makes possible to control the air-conditioning in an economical and ecologically sustainable fashion according to the latest standards. A collection of expressionist art is the corner stone for the museum’s policy in its continuing acquisitions and has shaped the concept behind the programme of exhibitions to date. These alternate between solo and theme shows on the history of gestural/expressionist currents in the twentieth and twenty-first century. 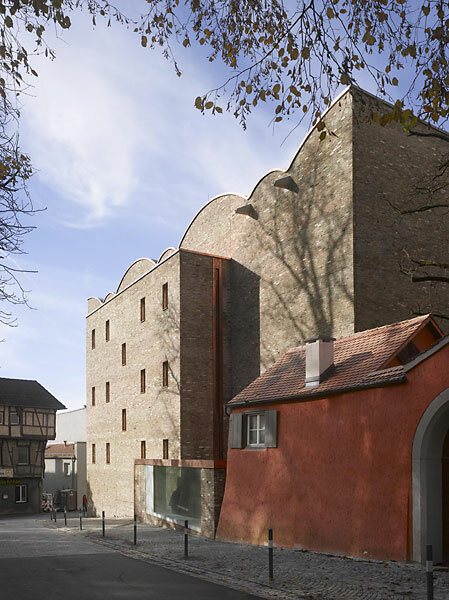 The German AICA has awarded the 2015 Museum of the Year Prize to the Kunstmuseum at Ravensburg in view of both, the architecture, which is a model that deserves emulating, and the exhibitions: the exhibition design is outstanding, but also the content is articulated and developed with great care in a generally comprehensible way, providing for a wider public. The exhibition, Gesichter. Ein Motiv zwischen Figur, Porträt und Maske (Faces: a Motif between Figure, Portrait and Mask; 20 March – 21 June 2016) at the Neues Museum in Nuremberg takes a sagacious look at a subject that has not ceased to fascinate humankind through the ages. In other words, it is a ‘popular’ show in the best sense of the word; at the same time it conveys much art-historical insight. The exhibition spotlights how, since the 1980s, following years of abstinence, after abstract and conceptual art, this subject has been making a come-back – now, however, not as one-to-one portraiture, but rather as interpretations of an image as transmitted in the media. The curator, Melitta Kliege, has accomplished a visually and intuitively appealing exposition with examples by Marlene Dumas, Jan Bas Ader, Tony Oursler, Günther Förg and Rosemarie Trockel, to name just a few. The result is an illuminating visit that works at both levels – visually and in content. An essay exhibition comprising just fifty works has taken on very recent art history in a sound scholarly way while having great aesthetic appeal. 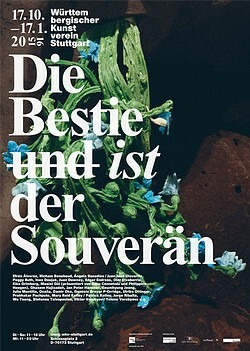 In an unorthodox, nonconformist and multi-perspectival approach, the exhibition Die Bestie und ist der Souverän (The Beast and is the Sovereign) investigates forms that the forces at work in hegemonic power are apt to take, setting about that quest through the examples of four highly acute domains. On its journey, the exhibition extends its area of investigation over a wide geographical ambit, featuring uncommon artistic stances and discoveries as well as dense clusters of work in all genres. Questions ranging from those of religion and its abuse, to the widespread, long-term damage wrought by capitalist economics, the knots and snares of biological research and the heritage of colonial power structures are engaged with intensively, the treatment is thought-provoking throughout. Rooted conceptually in Jacques Derrida’s allegorical figure couplet of the ‘beast’ and the ‘sovereign’, the curators succeed in erecting a highly controversial superstructure while not abusing the individual works as a mere illustrative backdrop. Beyond this, the scandal that broke out at the opening (in spring of last year) in Barcelona, with such wholesale consequences for the staff, has raised some far-reaching issues which will henceforth call for a sharp eye on the influence of politics and trade and industry on the programmes of public cultural institutions in Europe. How and why do censorship and inherent self-censorship come about? What exhibitions are not taking place and are currently not being mounted for that reason?